Attendees at the Gamelan Tunas Mekar’s Sunday afternoon “Celebration of Balinese Music and Dance” got a surprise: the Colorado premiere of “Cendrawasih,” a dance choreographed in honor of the Bird of Paradise, which inhabits Irian Jaya in the Indonesian islands. It is said often enough that all dance is imitative in origin, and “Cendrawasih” fits that idea. But this is a beautiful exposition, even without anthropology. The two dancers, Ni Ketut Marni and Ni Nyoman Erawati, in costumes of gold and crimson, became a vision in double, moving largely in unison and without undercurrents of fertility and mating often seen in Balinese dance. Even Westerners, unacquainted with the religious aspect of Balinese dance – and this is an island where religion and everyday life are intimately entwined – could appreciate it as a thing of beauty ina nd of itself. The ballet master Petipa realized that a visual idea expressed well is magnified when expressed by two, four, eight or an entire corps de ballet. The two dancers here brought several vivid vignettes of an exotic creature. The idea was expressed wholly in terms of Balinese dance, which uses reduced space (Bali is a small island with a large population) and traditional means. The women seem to crouch – expression lies in gesture, head and eye glances, and quivering fingers. Unlike ballet and most Western modern dance where grand sweeps of the foot and leg are part of the vocabulary, here much of the torso and below is mute. Dance is learned on Bali from childhood; witness Putu Tangkas, a 9-year-old boy whose impending manhood is unthreatened by dance. Indeed, his part of the evening, at the 9th Avenue Dance Club, was “Baris,” a warrior’s dance where swaggering steps and wide, solidly placed feet support stability. While he might spin once, this was an aspect of martial art rather than, as here, technique. 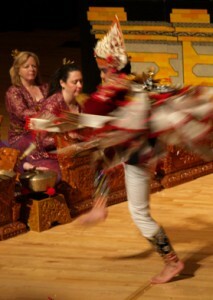 Gamelan Tunas Mekar is the accompaniment, the percussive orchestra encountered on Bali and Java. The Sunday afternoon performance was a benefit to raise money to bring a whole new orchestra of instruments to Denver. Why? The current collection of instruments is of the “angklung” variety, restricted in scope (basically four notes only) and designed for use in temple ceremonies to support cremations; its bright and essentially cheerful sounds are intended to speed a departing spirit. A new set of instruments will belnd with the current ones, which are owned by the University of Denver, and enhance the potential of the gamelan itself. It is played by volunteers who’ve devoted themselves to mastering not just the notes, but also the respect that governs performers in Bali. This benefit was to raise money to pay for the shipping of the new instruments, the commissioning and purchase of which has already been accomplished. The sound of a gamelan is one of consistent surprise and delight. Debussy and the impressionists embraced its novelty in their own music at the turn of the century.